O God, who chose to manifest the blessed hope of your eternal Kingdom by the toil of Saints John de Brebeuf, Isaac Jogues and their companions and by the shedding of their blood, graciously grant that through their intercession the faith of Christians may be strengthened day by day. Through our Lord Jesus Christ, your Son, who lives and reigns with you in the unity of the Holy Spirit, one God, for ever and ever. Today in the dioceses of the United States the Church celebrates the optional memorial of Sts. Issac Jogues and John de Brébeuf (priests and martyrs) and their companions (martyrs). They were Jesuit missionaries who died martyrs in North America, where they preached the Gospel. According to the 1962 Missal of Bl. John XXIII the Extraordinary Form of the Roman Rite, today is the feast of St. Peter of Alcantara, priest. He was one of St. Teresa's spiritual directors and encouraged her in her reformation of the Carmelite Order. French Jesuits were the first missionaries to go to Canada and North America after J. Cartier discovered Canada in 1534. Their mission region extended from Nova Scotia to Maryland. 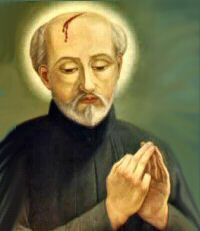 Isaac Jogues, John de Brebeuf, Gabriel Lalemant, Noel Chabanel, Charles Garnier, Anthony Daniel, Rene Goupil and John de Lalande (the first six Jesuits, the last two laymen) preached the gospel to the Iroquois and Huron Indians, and after being tortured, they were martyred in the area of what is now Auriesville, New York. The martyrdoms took place between 1642 and 1649. Ten years after the martyrdom of St. Isaac Jogues, Kateri Tekakwitha was born in the same village in which he died. These martyrs are co-patrons of Canada. Pray to the Holy Spirit to renew the evangelization of distant countries as well as the re-evangelization of our own nation. More Christians have been martyred in the 20th century than in the previous nineteen centuries combined. For example, pastors are being arrested and sometimes shot in China and Cuba. Believers are forbidden to buy goods or own property in Somalia. Christians who testify to their faith in Iran or Saudi Arabia may be put to death for blasphemy. Mobs have wiped out whole villages of Christians in Pakistan. Pray for courageous and zealous missionaries in these countries where the Church is persecuted. Support the Indian Missions in the USA. Visit the National Shrine of the North American Martyrs in Auriesville, New York. This site offers a wonderful gallery of pictures of the shrine. Learn more about each of the martyrs. You might also like to read this definitive scholarly biography, Saint Among Savages: The Life of St. Isaac Jogues, by Francis Talbot, S.J. Learn for Christmas the Indian Christmas Carol, the first American Christmas carol John de Brébeuf wrote to teach the Christmas story to the Huron Indians. Peter, surnamed Alcantara after the town of his birth, was eminent among the saints of the sixteenth century for an extraordinary spirit of penance and for attaining the heights of contemplation. He was a great mystic. Born in 1499, at the age of sixteen he entered the Order of Friars Minor. He was an apostle of spiritual reform in his own community and aided St. Teresa in her reform of the Carmelites. God revealed to her that no one would remain unheard who begged in the name of Peter; thereafter she was most eager to have his prayers and honored him as a saint while he was still alive. With great humility Peter shunned all favors from eminent personages, even though they esteemed him as the mouthpiece of God or asked his counsel; for instance, he declined the request to act as confessor to Charles V. Although she was at quite a distance at the time of his death, St. Teresa saw his soul entering heaven. Later he appeared to her and said: "O happy penances which won for me such blessedness!" Patron: Brazil (named by Pope Blessed Pius IX in 1862); Estremadura, Spain (named in 1962); watchmen. Symbols: Cross of twigs or boughs; ladder and star; dove; star. Born of wealthy parents, highly educated, and eminently successful, Peter of Alcantara left all things so that he might find in the poverty of Christ the inestimable riches of God. Meditate on how to be poor in spirit (Fr. Thomas Dubay's book, Happy Are You Poor: The Simple Life and Spiritual Freedom, is a good place to start). Pray for all those with power, authority, status, privilege and assets, that they will come to Jesus in humility and poverty of spirit and that as a result of this on-going conversion, they will change their ways and manners of living. Imitate St. Peter's self-denial by fasting and sacrificing a little sleep by getting up early enough to go to Mass.